In medium bowl, stir cookie mix, flour, oil, water and egg until soft dough forms. Shape dough into a ball; flatten slightly. Wrap dough in plastic wrap; refrigerate 1 hour or until firm. Heat oven to 350°F. On lightly floured surface, roll dough to 1/4-inch thickness. Cut with 3 1/2-inch fish- and starfish-shaped cookie cutters. On ungreased baking sheets, place cutouts 2 inches apart. Insert 1 lollipop stick halfway into centre of each cookie. Bake 9 to 11 minutes or until edges are lightly browned. Cool 5 minutes; remove from baking sheets to cooling racks. Cool completely. 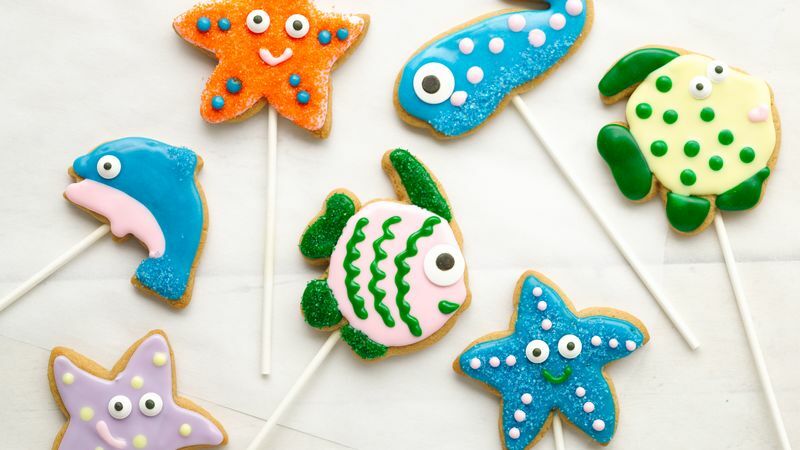 Decorate cookies with icing, gel and sugars. Attach candy eyes. Let stand until set. Variation Tip Make these pops with Betty Crocker® sugar cookie mix as an alternative to peanut butter.